Refining products is an important part of Oil Tycoon! After importing or drilling for oil, you can refine the oil into more usable products, such as lubricants and gasoline. Each product has certain characteristics. You can only refine 25 million gallons of crude per refinery per turn. As your net worth gets higher, you will want to buy more refineries so you can refine more per turn. 3. Refine Product Cost: This is the cost per gallon to refine each of the five products - lubricants, gasoline, fuel oil, oil products, and kerosene. See the Product Chart below for more information about the products. 4. Market Price: This is the current price you can sell the specified product. Before refining, you should make sure the market price is above the refine cost and that it yields a good profit margin. Be aware, though, that the price can change dramatically by the next turn. See the Product Chart below for more information about the products. 5. Crude in Stock: The amount of crude you have in stock, either from importing or from your land plots. 6. Refineries: The number of refineries you own. Each refinery can refine up to 25,000,000 gallons of crude each turn. 7. Refinable Gallons: The amount of crude you can refine in this turn. This is equal to the number of refineries times 25,000,000 minus any crude you have already set up to refine this turn. 9. Products to Refine: The number of gallons you have already started to refine for all products this turn. 10. Product to Refine: The number of gallons for each product you have already started to refine this turn. See the Product Chart below for more information about the products. 11. Refine Product button: Click these buttons to refine crude oil into the specified product. See Refining for more information. 12. Close button: Closes the current screen and returns you to the main menu. 13. Toggle Main Menu button: Opens the main menu without closing the current screen. If the main menu is already shown, clicking this button will hide the main menu. 14. Refine Products Graph: Displays the trend in refining costs over the past 12 months. The light green line indicates the refining cost of lubricants, the blue line for gasoline, the white line for fuel oil, the tan line for oil products, and the light red line for kerosene. To highlight a particular line, click on legend display on the right for the line you wish to highlight. To hide a line, right-click the legend display for the line you wish to hide. Before refining, make sure you have some crude oil. To begin, choose a product you would like to refine your crude into, such as lubricants or gasoline. Try to get the highest profit margin by looking at the refining cost and comparing them to the market price. Be careful, though, since these prices can fluctuate rapidly between turns. You could spend $3.000 per gallon of lubricants with a market value of $4.500, thinking you'll make $1.500 per gallon, so you refine 25,000,000 gallons. By the next turn, the market price suddenly dips to around $0.400, and you have 25,000,000 gallons of worthless lubricants in your inventory! Once you have decided on a product, click the product's Refine button. The graph is replaced by a place where you can specify the number of gallons you want to refine for that product (shown below). Type it in and click OK. The amount of crude you specified will temporarily be taken out of your inventory while it's being refined. After you advance the turn, your refined products are put in your inventory, and you can choose to sell them at any time. Lubricants can jump between prices very rapidly. You can make a lot of money off of them, but you can also lose a lot. Gasoline isn't quite as volatile as lubricants, but they can still give some high profit margins. 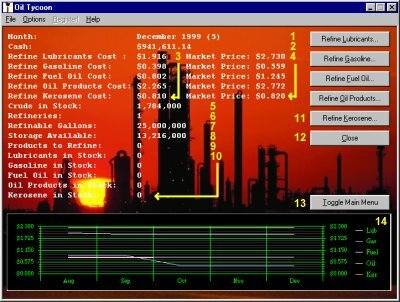 Fuel Oil will often have a refine cost and a sell price close together, but sometimes they can yield a good amount of profit. Oil Products often yield a good amount of profit, and if lubricants and gasoline aren't very good, they can be a great choice. Kerosene rarely changes in price, and they often don't yield a good profit margin.